Who wandered o'er the land in search of fortune plenty. Picnic baskets and such were not his bill of fare. Only ruby gemstones could content this clever bear. Bentley gathered his jewels with the greatest of care. Showered fame and fortune on this rarest of bears! 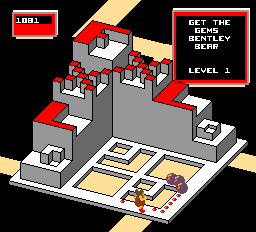 Life is no picnic for Bentley Bear as he walks the crossroads between waves in new CRYSTAL CASTLES from ATARI. Each wave presents him with a tempting trail of ruby gemstones winding in and out and all around a 3-D super maze structure that varies in 16 different playfields, including a castle, fortress, palace, and even a dungeon. There are tunnels to explore, elevators that take him from one plateau to another, and sometimes a hidden ramp! Bentley's determined to collect all the gems – which treats him to a rapidly escalating point calue for each succeeding stone plucked… all the way up to 99 points apiece. The trich is to escape all the scary creatures that chase him along the way and do their share of gem gathering to lessen his chances. If he is able to beat out his competition and get the last gem in a wave, he also captures a handsome bonus. The screen is a fury of action as our furry friend encounters nasty trees which vigorously pursue him. Gem Eaters wind their way to digest their portion of the jewels. Crystal balls with magical faces roll along th wreak their havoc. If Bentley takes too much time, a swarm of bees descends to get him moving. Each level of game play progresses through four separate maze waves, and it is on every fourth wave where Berthilda the Witch lives. The emise of Berthilda is worth 3,000 points to Bentley Bear, but he can only do her in while wearing the magic hat positioned somewhere on the screen. The special powers of the hat run out quickly but do make Bentley invincivle to all opponents for a few seconds. 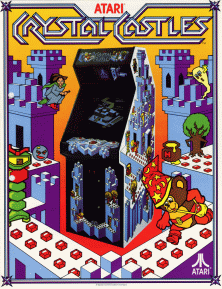 CRYSTAL CASTLES also features a Warp Tunnel through which a player can jump ahead – when beginning a new game – to the level of play he just completed in the preceding game. And there are chances for Secret Warps to be discovered in later waves! Warping alway benefits the player with at least one bonus life, and two if the player warps to level 4 or above.